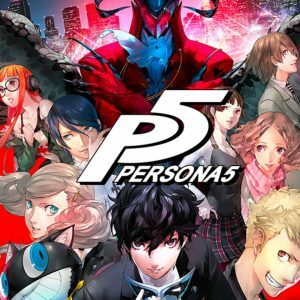 Atlus brings us another installment in the Persona series, this being my first time playing in the history of the franchise, should this prevail justice or should it have just stayed in Momentos? let’s find out. In Persona 5 you play as a high school boy who has just been transferred to Shujin Academy in Tokyo, forced to leave his home after being put on probation for being framed for assault of which he did not commit. Your character stays with a guardian by the name of Sojiro, and upon arriving there you realize there is a strange looking eye app on your phone and you delete it and unfortunately, it keeps popping up on your phone. When you arrive at Shujin Academy you are pretty much the most hated student there because of your criminal past, it isn’t until the second or third day you meet Ryuji and Morgana; you are on your way to school and somehow the eye app on your phone activates itself taking you to another world where people who need a change of heart are showing their distorted desires and showing what they think is rightfully theirs, in this case, a palace so your job is to go through the palaces and steal their treasures to change their hearts. After the first occurrence, Morgana explains to you how you are a phantom thief, someone who can go to another world and change the hearts of others, but it is a little more complicated than that in this case, you have to find your next target whether it be a big time crime boss, politician, teacher or hacker; find out where their palace is, invade it, find the treasure, send the calling card, fight this person in order to steal their treasure and this will change their heart. As you progress through the game you will find more companions to go through the palaces with you, Seven others if I am not mistaken. The Gameplay in Persona 5 is nothing like I have ever seen before when you are in the palaces you use stealth a lot to ambush your enemies, once you get into a battle it is turn based. This Persona is a bit different from what I have heard you can not grind in 5 as much as you could in others which is unfortunate especially when you want to level up; not only do you level up but your companions do as well and your personas. When you are not out changing the hearts of authority figures you are living your life like a normal high schooler, studying, hanging out with friends, holding down a job, having relationships, taking school tests and exam, and so much more. As you progress through the game you will see your relationships increase with your friends and others which give your perks in and out of the castles. Persona 5 was one of those games if I was not playing it I was thinking about it or talking about it, a great game that really brought me into the love of the JRPG world.